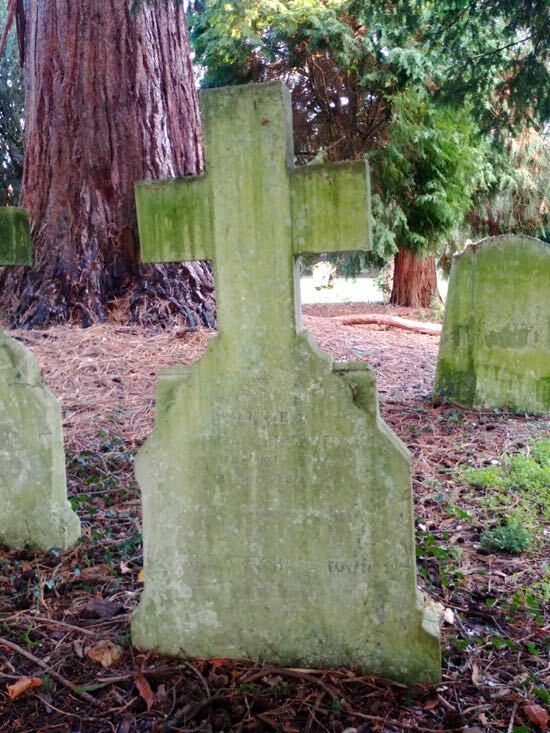 Had it not been for the curiosity of a four year old boy, walking with his dad through the churchyard of St Mary's North Mymms, this story may have never been told. 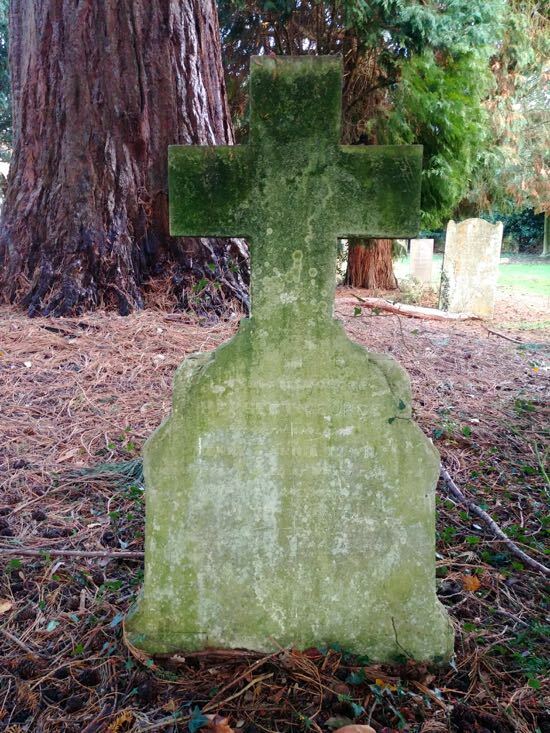 But the inquisitive mind of the child, who wanted to know what was written on the headstones and the stories behind those buried in the graves, resulted in a father and son research project that uncovered a moving and tragic story of Victorian life and death. This feature about the short life of railway worker Herbert George Town, from Marshmoor, was written by David Lister with this help of his son. It was first published in the April 2002 edition of the St Mary's church magazine. This is the story, as far as can be told so long after, of the short life and violent death of a young man who was born and bred in the Parish of North Mymms. Assisted in researching the young man's times by my 12-year-old son, we soon came to know our subject, somewhat affectionately, as Herby. Herby was no relative of ours. We first came to hear of him when my son was very young, and in the spring, summer and autumn days when there was nothing else on the agenda, we would ride the short journey out to North Mymms Park to go blackberry picking, horse-watching or just plain old exploring. We would park our car near the church and walk through the churchyard. Fairly, early on, when my son was perhaps four years old, he would ask me what the headstones were, and having explained, he liked to hear about the people who were resting below them. And so, we first met Herby. Some of the lettering on the left is badly worn; the "4" in "4th CHILD" is now illegible as are the first four letters of the word "instantly" and the "L" from "L&NWR". Suffice to say, there was enough inscription left to impart that a young man had met an untimely death. Many questions were asked by my son. For most of them I had but one answer. "Maybe one day we will try and find out". Herby's resting place became a spot at which to pause whenever we visited North Mymms. We would stand quietly and wonder what had happened to him, speculate about his life, and talk in general terms of living in Victorian times. It was a natural progression then, from speculation to research, and when some eight years after first meeting Herby, we needed a subject for a research project, there was only one choice. My son, now in his second year at secondary school, is often set homework that involves research, so we decided we would choose a subject and find out as much as possible from all the sources to which we had access. My son would be able to get to grips with some primary source material, see how public records are kept, and learn just how much information is available about our history - if you know where to look. This then is a report on our findings. Our starting point a gravestone and our subject Herbert George Town. Herby's father, Henry Richard Town, was born around 1842 in the Sussex town of Little Hampton. His mother was a Lincolnshire lass born in Langtoft around 1844. It appears that Henry's work on the railways brought them together and they were married. Their first child, William Edward, was born in 1865 in Huntingdon where they made their first home together. Walter Frank, their second son, followed two years later. By 1869 the family had moved to the little village of Abbots Ripton - a stones throw from the railway lines and Annie gave birth to Mary Emily Henrietta. 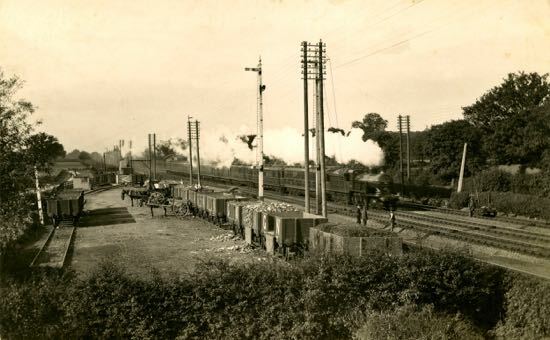 Henry, a signalman for the Great Northern Railway, soon received another posting, and the family was on the move again, this time to set up home with the other railwaymen's families in the Parish of North Mymms, Hertfordshire. At that time, the community of local railwaymen lived in the area of the Parish known as Marshmoor. Marshmoor still exists, much of the area now given over to an estate of mobile homes, but in 1871 there were only six households in addition to Marshmoor Farm, and of those six households the head of all but one had employment with the railway. The remaining one household was that of 36 year old Charles Hill, a police constable. 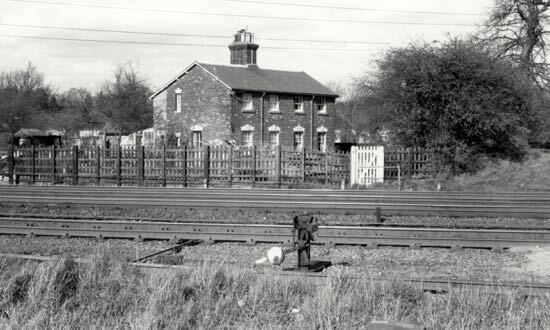 At least three of the homes were actually owned by the railway company, and these were situated close together between Marshmoor Lane and the railway lines. Two were attached and in the exact position of today's Railway Cottages. The third was closer to the tracks and known, for obvious reasons, as the Black House. Today, there is no trace of the Black House or of the signal box that was located a few yards down the track. 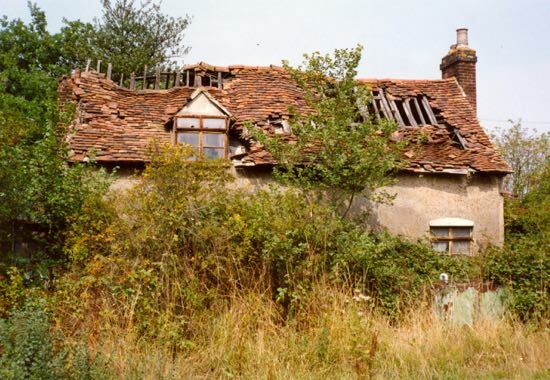 Today's Railway Cottages are believed to date from 1898, although built on the same plot of land as their predecessors, Railway Cottages are in fact only one home now, although they retain their old name the partition wall was knocked through in the mid 1960s. Based on surviving evidence, we may assume with some certainty that the Town family moved into one of these three homes. Applying a little logic based on the sizes of the families residing there at the time and the space available in each of the three homes, we may further surmise that the Town family lived in one of the railway cottages as Black House was noticeably smaller. The other cottage was also home to a railway family - possibly that of Marshmoor resident George Blandford who was also a GNR signalman. It would certainly have been convenient for work, as Henry and George would have had just 50 yards or so to hop over the tracks and walk to their work at the signal box. William Town was seven or eight years of age, and on Monday, 4th March 1872 he was admitted as a scholar to the Boys' School less than half a mile away along Huggins Lane. 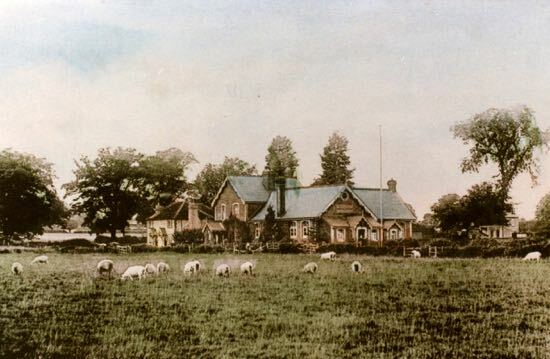 Welham Green was as may be expected, much smaller then, and largely contained in the area south of the junction with Dixons Hill Road and Dellsome Lane, so open fields flanked William's walk to school. He would have passed less than a dozen cottages along Huggins Lane before reaching the impressive country pile known as Frowick on his right. From there he would have continued along the Lane for another two minutes, and thus to school. The school had once been the Parish workhouse and comprised two or three cottages knocked through. It had undergone some restructuring, for in its early days as a school it had been too narrow and very low in the ceiling. William was one of some sixty boys, his classmates being the sons of agricultural labourers, artisans and servants and a fair few of his comrades were 'railway boys' like himself. His little brother Walter would join him in two years, and when Mary was old enough, she would attend the school for girls and infants at Water End. Although the intention of The Elementary Education Act of 1870 was to enforce a duty on parents to send their children to receive a good education, school attendance was still not free. It is a good indication of how seriously Henry and Annie took this duty by the fact that they sent all their children to school and kept them there past the minimum leaving age of 12 years old. Henry and Annie were to have eight children together, and on 18th February 1871, their fourth, Herbert George was born. Closer to home, the Town family's neighbour 100 yards up Marshmoor Lane were the residents of Marshmoor Farm. 71 year old William Reynolds was at that time the farmer and head of the household. Over the years, tenancy of the farm was to change several times as was its size. In 1871 it encompassed 23 acres. Herby was baptised on 4th August 1872 and the Town family continued to grow. In 1873 Albert was born, followed in 1875 by Ernest Harry. In the same year Mark Twain published "The Adventures of Tom Sawyer". The following year brought the work of Alexander Graham Bell to fruition with the invention of the telephone, and on 11th August 1876, William Town was given half a crown for good school attendance. Prizes were given out during the School Treat, which heralded the beginning of the school holiday. The boys and girls and teachers met at Water End School and walked in procession to St. Mary's. As they approached the church they sang 'Brightly Glows Our Banner'. 16 days later, on 27th August, Ernest was the centre of attention at St. Mary's when he was baptised. Herby was six years old in 1877 when a second daughter was born to Henry and Annie. Edith Kate shared the year of her birth with Hermann Hesse, the author of 'Steppenwolf' and 'Siddhartha'. By now Herby had already started school, earlier than was the custom, having been admitted on Monday, 24th April 1876 together with one William Moore and Thomas Atkins. Mr George H. Foster, the master at that time noted the attendance of 65 scholars. 1878 began with a tragedy. The boys of the Boys' School and the girls and infants of Water End School were eagerly anticipating the school treat that had been deferred from the previous summer, when one little boy - a neighbour of the Town family and a contemporary of Herby's - was killed by a train at Marshmoor. 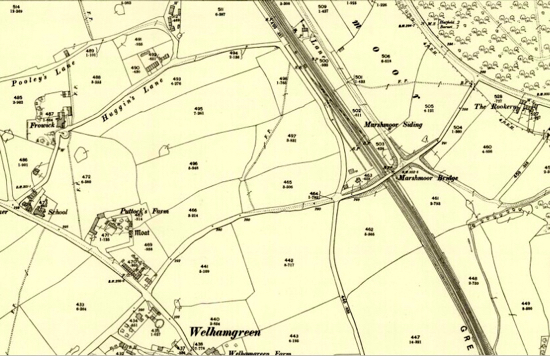 Marshmoor Bridge was not built until the late 1880's and the railway had to be crossed by level crossing. On 10th January, little Samuel Marlborough had completed his morning attendance at school and was on his way home for lunch. He came to the level crossing and was apparently so intent on watching the up-train, he failed to see the down-train. It knocked him down and he was instantly killed. The long-deferred School Treat was held on the following day, but it was marred by the tragedy. In his address the vicar made sad reference to Samuel's accident. Later, the Band of Hope - a local temperance group, initiated a subscription so that cash could be raised to put up a memorial. Herby lived in a time of rapid development in terms of inventions and discoveries. On February 19th, 1878 Thomas Edison obtained a patent for the phonograph and in the same year London first enjoyed the benefits of electric street lighting. On 31st August Edith Town was baptised. It would have also been about this time when William left school and took up the duties of an Errand Boy. The month before Herby's eighth birthday was an inauspicious time for the British Army, as it saw the defeat and slaughter of a British and colonial column at Isandlwana by the Zulus. Few escaped the Zulu's mopping up 'operation' and drummer lads and regiment's boys as young as Herby's brother William were amongst the dead. Although the Zulus were defeated two months later at Khambula it tends to be Isandlwana - and its off-shoot, Rorke's Drift that are remembered. The Zulu war of 1879 was virtually the last campaign that saw the British going into battle wearing scarlet coats, blue trousers and white pith helmets. Elsewhere in the world, history continued to unfold, and just over a fortnight before the Zulu's defeat at Khambula, in the now West German town of Ulm, Albert Einstein was born. 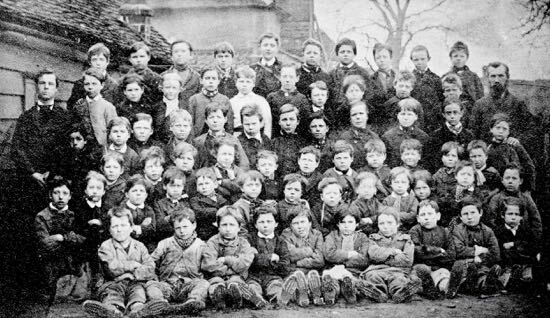 As railway children, the Town boys and girls perhaps had an advantage over some of their school mates in achieving good attendance marks, for they would not have been required to join in the seasonal work that would keep some children off school. The children of farm labourers, for example, could not be spared for school during harvest time. Nevertheless Herby did well and was rewarded for his attendance during 1879. He received half a crown for 391 attendance marks, equal to his school mate Robert Pollard and beaten only by Alfred Longstaff whose attendance mark was 394. Herby was 8 years old. There is evidence to suggest that Herby sometimes went 'bashing' instead of to class. Herby's big sister Mary was 11, when her work was noticed by the School Inspector and used as an example. She was working through her Standard VI year on such subjects as composition, dictation, grammar and long arithmetical exercises to 'find the greatest common measure of a series'. Compositions were generally about history, the following being an example of Mary's work. George the third King of England did not like to appear in public. He loved quietness. One day nearly all the inhabitant of a town assembled together to welcome the king. But instead of going that way he took another route, but as he was going that way he saw every house, every road and every lane deserted. He could see no one only a woman out in the field at work. He at once went over to her, and said, "My good woman how is it that you have not gone with your neighbours to see the king." Then the woman said "I have a large family sir and it takes all I can provide for them but I should very much liked to have gone and seen him. Good King George, may GOD bless hint [sic]." Then the king took a note out of his pocket of the Bank of England, and gave it to the poor woman and said, "You can tell your neighbours when they come back that you have seen the king, and they have not." In 1881, having made the transition from scholar to working lad, William, now in his 17th year, was first to leave the family home and follow in his father's footsteps to gain employment with the railway, but not as a signalman as we shall see later. Historic events included the death of Disraeli, the assassination of US president James Garfield, the surrender of Sitting Bull in Dakota and the outbreak of the First Boer War. In 1882, another son, and the last to be born to Henry and Annie, came into the world. He was named Percy Joseph and was baptised on 27th August. The Town children continued to do well at school and in 1883 Ernest, now eight years old, earned the prize of five shillings for good conduct. The year also saw thirty-three-year-old Robert Louis Stevenson publish 'Treasure Island'. Hot on its publishing heels, Mark Twain published Huckleberry Finn on 1st January 1884. A year on and the paper vendors were calling out the death of General Gordon at Khartoum. By now, having done well at school, Herby was the school's top boy. Later in the year, it was time for Herby to complete his time as a scholar, and on Monday, 9th June, 1884 he left to take up a place in the gardens of Squire Church. That same year, Henry (Herby's father) was elected to be a Sidesman at St. Mary's, a post that he was to hold for several years. Although Herby missed the excitement of witnessing part of the school ceiling falling onto the head of their master (without serious injury except perhaps to his dignity) it is highly probable that Albert and Ernest were there. On a Tuesday afternoon in May 1886, just after a singing lesson, a square yard of ceiling fell onto the head and back of Mr William Knowles. Discretion being the better part of valour, he sent the boys home. That evening part of the school was declared unsafe. School continued for two months until another fall one Friday night, when an architect reported the roof to be in an unsafe and dangerous condition. The old building was finally giving up the ghost. A temporary classroom of iron construction was set up in the playground. Over the next year, the old school was demolished and a new one built in its place. The architect, Mr Bates and Mr Curnow the builder got to work and in August 1887 Mrs Cotton Curtis laid the foundation stone. Building costs were estimated at £950. The building still stands although it has now been converted into several residences. During the last full year of Herby's life The American Exhibition came to West Brompton, Buffalo Bill and his Wild West Show amazed the crowds. Was the Town family amongst them? February 1888 was soon gone, and Herby was not to see another birthday. He was 17 on the 18th of that month. It was most probably on Friday, 18th May 1888 that Herby left his family at Marshmoor. We don't know whether he walked up to Hatfield or was afforded some form of horse-drawn transport to the Station. 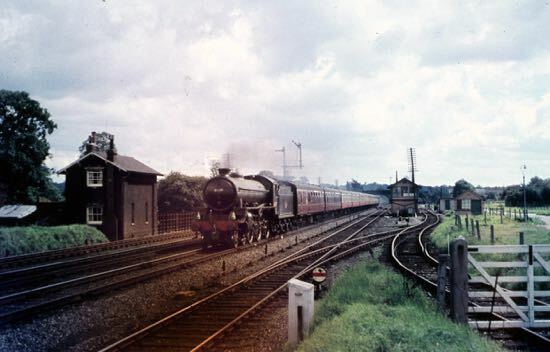 As the son of a signalman he may even have been allowed the special privilege of joining the train from Marshmoor Sidings within sight of his home since birth. Nor do we know whether his mother and father, his three younger brothers and sister came to see him off. It is nice to think so - just as it is to suppose that his elder brother Walter was there to meet him at the other end of his journey. If so he would most probably have alighted at Cross Lane Station, Salford - just two minutes' walk from Walter's home. Walter was already working for the L&NW Railway Company and had his home at 14, Lord Nelson Street. The street is no longer there; it together with the adjacent streets made way for what is now the Junction 3 roundabout of the M602. The M602 has also taken the space of most of the Liverpool and Manchester Line in the vicinity, following its course and eating up Cross Lane, Seedley and Weaste Stations. Whether Herby spent the weekend looking for lodgings close to his new employment or Walter had already found him some is unknown, but lodgings were indeed found. And they could hardly have been more convenient for Herby for they were situated within 600 yards of Weaste Station at 26, Mode Wheel Road. In 1888 Mode Wheel Road followed a line to the east of which was built up with the many residential streets and businesses of Salford. To the west were large tracts of open countryside. Unlike the road where Walter lived, Mode Wheel Road still exists, although now it no longer forms a virtual demarcation between countryside and conurbation. The whole area, apart from that to the south, is heavily built up. The road runs south towards Salford Docks and terminates close to a large engineering works, just as it did in 1888. Now though, the dwelling houses are gone, today's buildings all being commercial. It is likely that Herby started his employment early on the morning of Monday, 22nd May, probably reporting to his new boss, the stationmaster Mr Isaac Daniels to be directed to his duties. Herby's room was in a house in a terrace of six running between Bute Street and Friswell Street right opposite a brick works. He could easily have made the walk to work within ten minutes. Turning left out of his front door, he would have walked up to the junction with Eccles New Road and turned left again, then passing by the Swan Hotel on the right as he made his way to Weaste Road. Before reaching that road, he passed Forsters Wood and Oakley, a park with a large pond - areas of open space now only remembered in the names of the streets that occupy the same space. Reaching Weaste Road, Herby turned right. 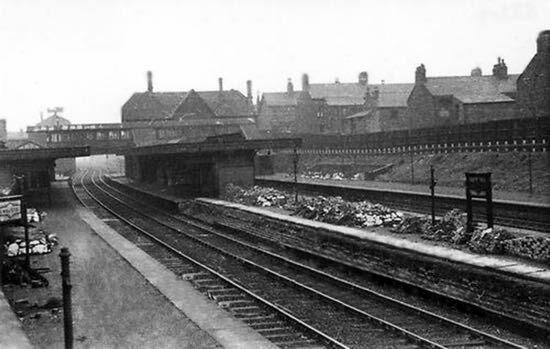 Now crossing over the M602, Weaste Road then formed a bridge over Weaste Station and the railway lines with the entrance to the station being on the west side directly over one of the platforms. Passing through the entrance to the Station, one selected the desired platform and then chose the appropriate flight of steps to give access. Herby was to make this journey only four or five times. It is reasonable to assume that Herby spent much of his off-duty time with his brother Walter. Herby was a quiet and not too venturesome lad, and probably would have been happy with the company of a familiar face in those few days away from home. He was certainly with Walter during the evening of Wednesday 23rd May, because Walter was the last person to have seen him alive, as far as records tell. It appears they had an enjoyable night and that when they parted, Herby was well and hearty. Herby was due to begin work the next morning at 5.15am. His boss, the stationmaster Isaac Daniels was at the station by 5 o'clock, but he didn't see Herby. There is evidence that he had been about, because he left his breakfast in the porter's room. At 5.45 am several events reportedly occurred simultaneously. A train arrived at the station from Eccles, a fast excursion train to North Wales passed through, and Joseph Crompton saw Herby lying on the fast down platform. A little before 6, Mr Crompton, who was the station's pointsman, told the stationmaster about Herby. Mr Daniels went to investigate and found that Herby was dead with an awful head-wound. There is no record of the fact, but it is logical to assume that the police were called from the nearby police station in Eccles New Road, just five minutes' walk away. Herby's body was probably taken to the Church of England Mortuary Chapel in Salford Borough Cemetery. An inquest was held the following day in the Swan Hotel with coroner Frederick Price presiding. Mr Price heard evidence from Isaac Daniels, Joseph Crompton and Herby's brother Walter. There is no record of any enquiries being made of the locomotive engineer, his fireman or any of the passengers from the train that is supposed to have killed Herby. The conclusion was that the excursion train had struck and killed him, and that is most probably the case. It is interesting to note though, by today's standards a coroner would not record a finding of accidental death in similar circumstances without a far more thorough enquiry. It is hard to fathom how the fast through train could have caused the injury bearing in mind Herby's body was found on the platform. Did someone open a door that struck him? Was something protruding from the side of the locomotive or train? Did Herby lean into the path of the train or trip and fall into its side? This far away from the event we shall never know, but it is testimony to the fragility of life and the frequency of violent death prevalent in that period that the questions were apparently not asked at the time. Herby made his last journey on Sunday, back to his home in Marshmoor that he had left a little over a week before. He was buried at St Mary's on Monday, 28th May. "Two sad fatalities connected with our Parish and neighbourhood have to be recorded. Herbert Town, in his eighteenth year, had left his family only a week to commence his career in the L. &N.W. Railway Company's service at Weaste, near Manchester, when he was struck by an excursion train and instantly killed. The courteous Station Master of Potter's Bar also, after a short but painful illness, the result of an accident to his hand, died on the 28th ult. The comfort is that we believe both served the Heavenly Master here below, and were ready to enter on a higher service above. It is almost needless to add that the relatives have met with the deepest sympathy from all who knew them." The headstone that lies to the right of Herby's is that of his mother and father, Annie passing away in 1905 and Henry reaching the respectable age of 84, finally 'given his rest' in 1927. 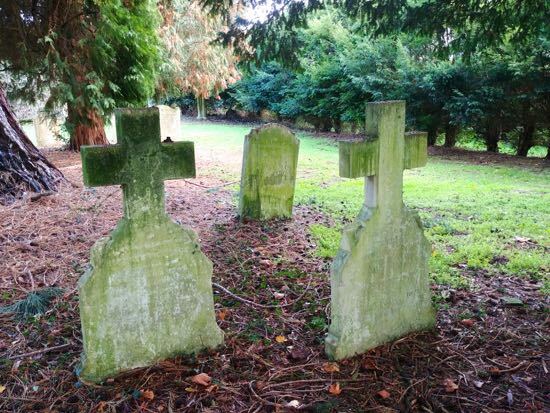 None of their other children appear to be buried in the churchyard, so Herby, who they lost first, stayed with them the longest and remains with them still. That he was mourned and missed is certain, and if an indication were needed then it may be found. Herby's eldest brother William, by now a railway fireman, was living at Hampden Road, Peterborough. On the 22nd October 1888, five months after Herby's death, a baby boy was born to his wife Lucy. Enabling the name of a lost brother to continue, they named him Herbert. © David Lister - Reproduced with the permission of the author. The text for this piece was written by David Lister with research and help from his son. An abridged version appeared in the April 2002 issue of the St Mary's Church parish magazine. The piece is copyright of David Lister, who has kindly given this site permission to reproduce the story. Images and links have been added to the original text. The images are either from the Images of North Mymms Collection, or have been taken by the North Mymms History Project team. The North Mymms History Project would also like to thanks Martin Ferdinando, churchwarden at St Mary's Church, who was the editor of the parish magazine when Herby's Story was first published, and who has helped with background information.